Ducati has got off to a great start after its re-entry into the Indian market in June this year. Ducati first entered India in 2008 in a tie up with Precision Motors which is a part of the now infamous Shreyans Group who also imported Ferraris, Maseratis and Porsches. The partnership did not end up well as the Indian subsidiary did not live up to the Italian bike marquee’s image in India. The initial entry of Ducati in India created quite a buzz and many buyers booked their first Ducati. Sadly, many of them had to face delayed deliveries and a few did not receive their bikes at all. Similar problems were faced by Ferrari, Maserati and Porsche buyers under Shreyans that eventually led to termination of their respective partnerships as well. Ducati recently delivered 100 motorbikes in Mumbai and doesn’t want to look back. Among best-sellers have been the Scrambler and the Diavel. The Scrambler is priced at Rs. 6.38 lakhs and is currently the cheapest Ducati you can buy in India. It is manufactured at the company’s facility in Thailand and comes with an 800cc, L-Twin, air-cooled engine which produces 74 PS of power and 68 Nm of torque. The Diavel on the other hand is priced at Rs. 13.82 lakhs. It is positioned as a power cruiser in Ducati’s India portfolio and is powered by an 1198cc, L-Twin engine with 162 PS of power on tap and 130.5 Nm of torque. 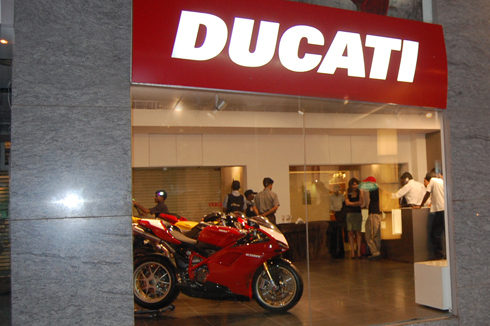 Ducati currently has three showrooms in the country located in Mumbai, Delhi and Gurgaon, the latter most being Ducati’s biggest showroom in the world. A new dealership will be opened shortly in Bangalore with other major cities to follow suit. These outlets will provide initial sales as well as after-sales support for new and existing Ducati customers. The company is offering almost its entire range in India like the Scrambler, Monster, Diavel, Panigale, HyperMotard, MultiStrada and the HyperStrada. The most expensive of the Ducati range is the Panigale R which is priced at a whopping Rs. 46 lakhs (all prices ex-showroom, Delhi). All bikes are imported via the CBU (Completely Built Unit) route and the Panigale R competes with the much more advanced and insane looking Kawasaki H2 in India which is priced at Rs. 29 lakhs.